Bosley Cottage is a two bedroom holiday cottage which is attached to the owners' 17th century home (to the right on the photo). 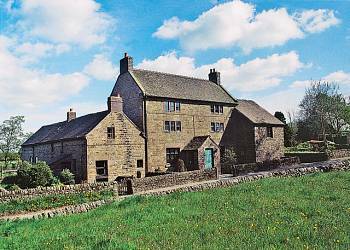 It is situated in the small hamlet of Onecote, near Leek in Staffordshire and is to the South of the Peak District National Park. Although refurbished the cottage retains a lot of original character, such as low windows and beamed ceilings. It also has an enclosed courtyard patio with parking for one car. The lounge is comfortable with 2 sofas and a woodburner stove. There is a TV and DVD player for entertainment and patio doors leading out to the courtyard. There is a fully equipped galley kitchen which includes a dishwasher and a dining area. There are two bedrooms: one double room with a 4-poster bed and a twin room. Pets are allowed (maximum 2 dogs). with shower over bath and toilet.